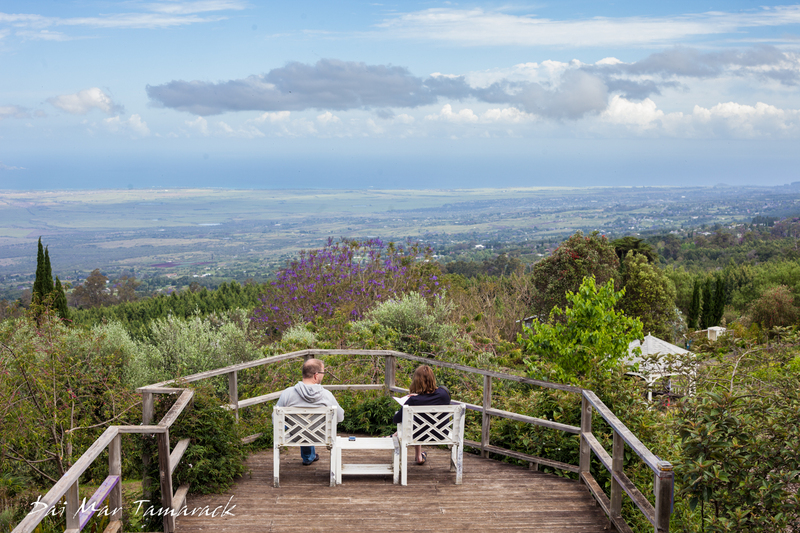 The last few days have been spent part way up Haleakala Volcano on the island of Maui in an area locals simply refer to as 'upcountry.' 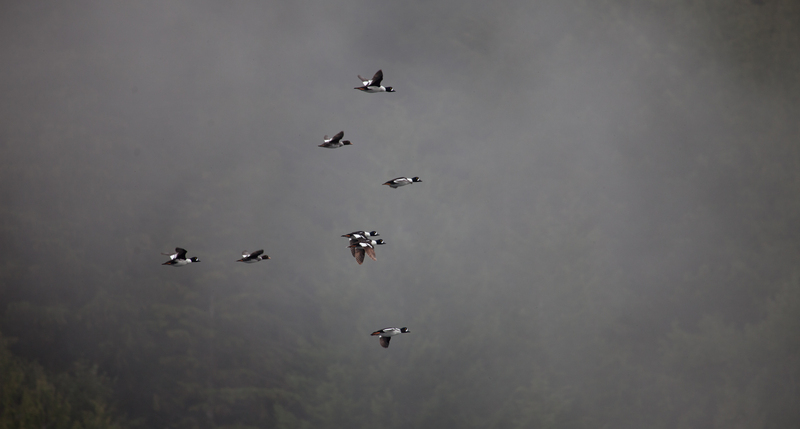 The weather ranges from mild to downright cold, and it boast a wide range of flora and fauna to go with it. 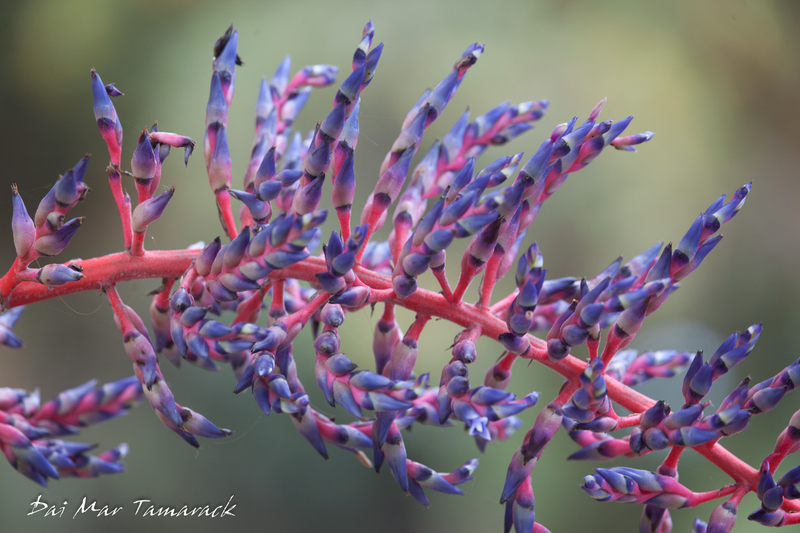 Our first spot to check for unusual plants was the beautiful lavender farms in Kula. 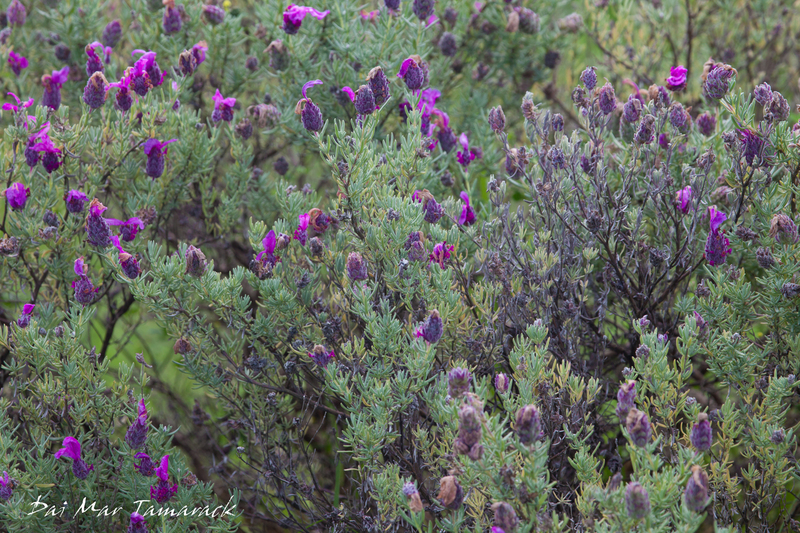 Blooming jacaranda trees and rows of different species of lavender showered the garden in shades of purple. 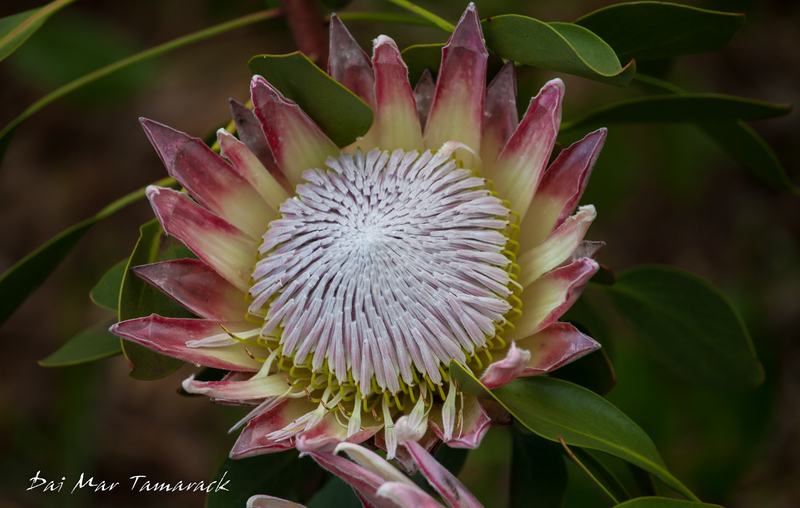 And with all the other blooming flowers of proteas, bromeliads, and others there was a rainbow of colors. We searched high and low for the resident Jackson's chameleons in the area but could not find any. 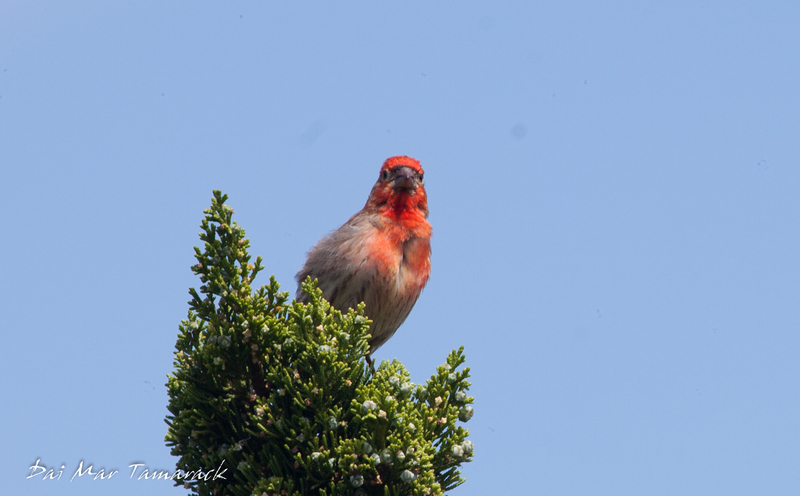 A couple of purple finches watched us hungrily as we enjoyed our lavender tea and scone but we did not share. Next we were off to the last remaining stronghold of the honeycreeper birds on Maui, a grove about 6,500ft up the volcano called Hossmer's Grove. 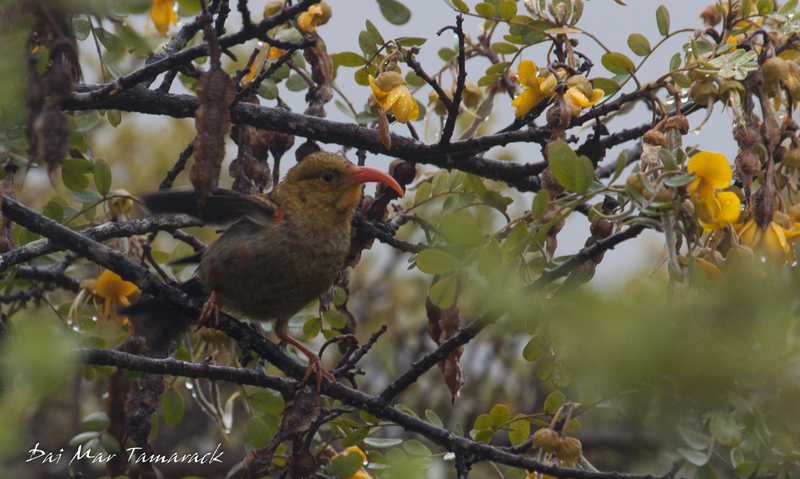 The climate is too cold for mosquitoes up here so honeycreepers, which are several species of finches all descendant from one finch anscestor, have survived where their lower elevation cousins did not. 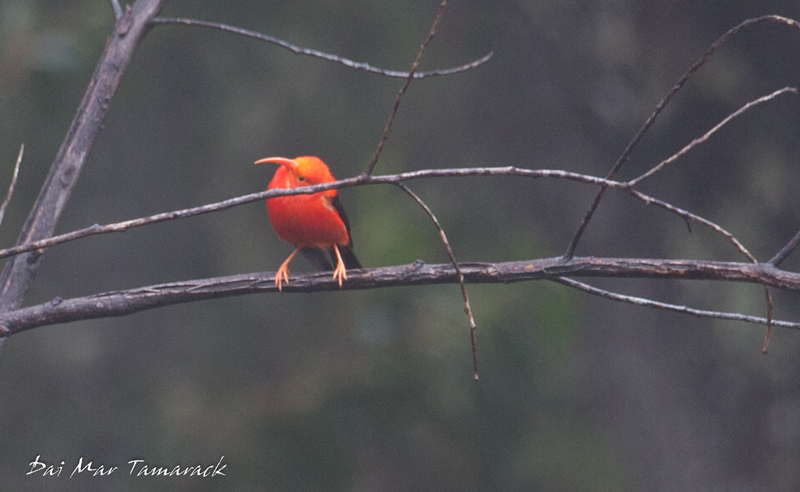 It was my goal to get a bright red I'iwi on camera, which I did but still not too close. 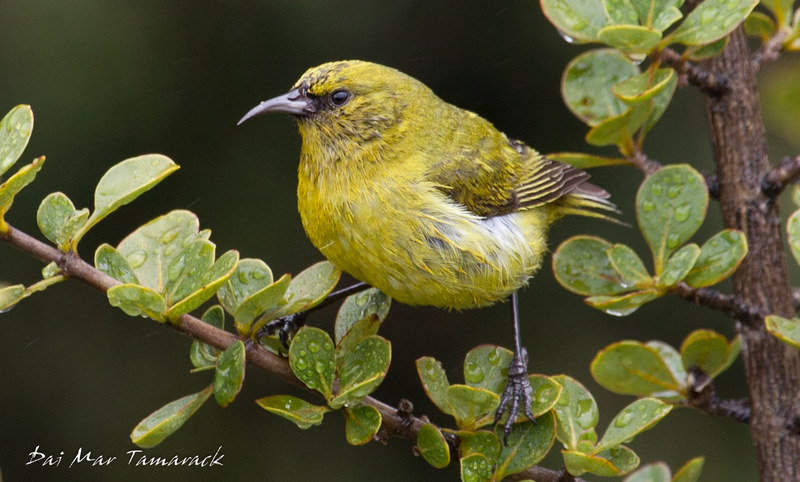 For the first time I did managed to capture a photo of the rare Maui Amakihi, a yellow honeycreeper with a medium size curved beak. He landed very nearby and stayed in place just long enough for me to snap this picture before fluttering off again. 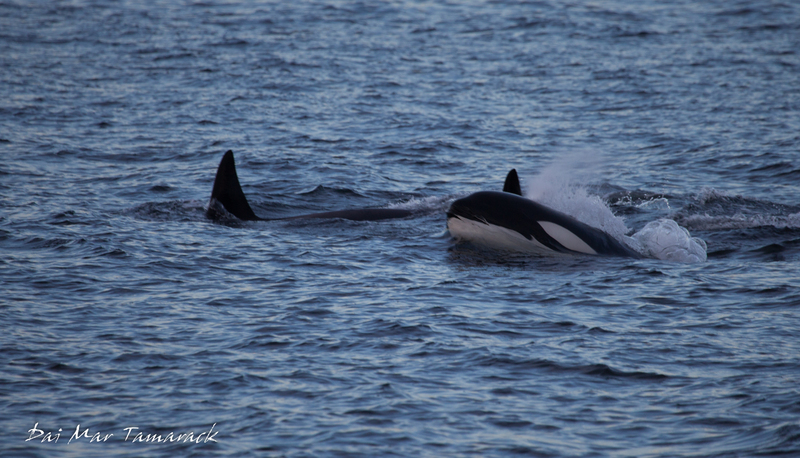 The Hawaii season is finished, the whales are all headed north back to their feeding grounds in Alaska, so that is where I am headed as well. It was a great winter season leading trips in Hawaii onboard the Safari Explorer, followed by a multi-island private trip for a family that I will only say was... educational for all involved. But now it is on to new adventures, onboard a new boat. You may even call this one a yatch. The Safari Quest is a beautiful boat inside and out, with all the amenities you could ask for, including a pastry chef. We can take a maximum of 22 passengers with a compliment of 10 crew. 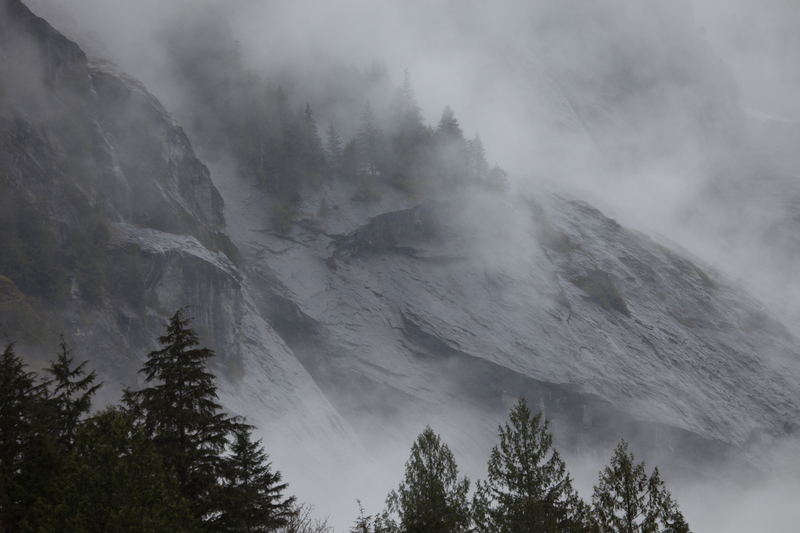 We have a shoulder season itinerary of the Pacific Northwest and British Columbia. Then we will spend the greater part of the summer sailing through Alaska's Inside Passage. I am still the expedition leader, however now I am also the guide. I'm familiar with this set up in Hawaii but all of my Alaska experience to this point has been managing a team of guides, and leading excursions every once in a while. Now I'll be out two times a day and still have all the paperwork to finish before sleep. Luckily the Safari Quest has the best espresso maker in the fleet, a wonderful multi-tasking crew to help me out, and about a 15 second commute to work. We have one B.C. trip under our belts already and it was a huge success. It is pretty wild waking up on day two in a different country, and the wildlife and landscapes are breathtaking. And this is all before we even make it to Alaska. Its going to be a fun season. We just completed our first week of the season sailing the Safari Quest through British Columbia and the San Juan islands. 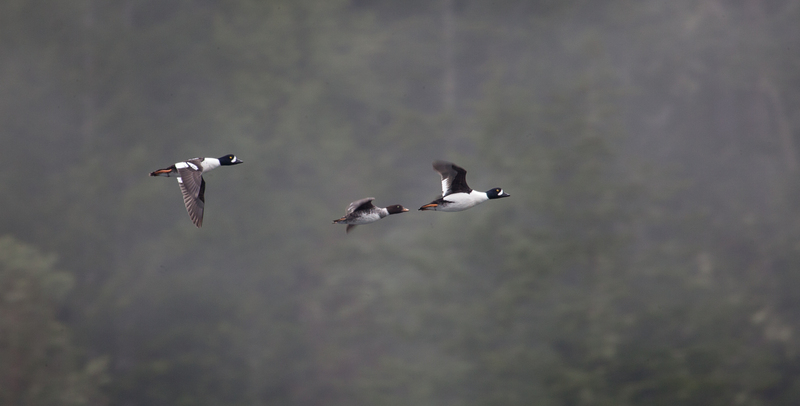 We will run this itinerary during the shoulder seasons before and after our Alaska summer. I had not spent much time in British Columbia so I was anxious to get out and see it from the water. I had sped through the channels before on our way to Alaska in previous seasons but was never allowed to stop. 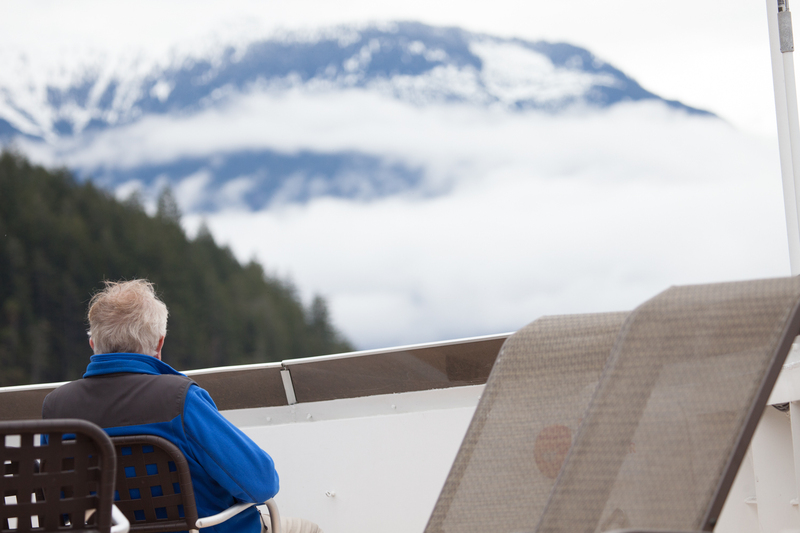 The Quest is a SOLAS boat which allows us to take her internationally into Canada waters. This does mean a few stops during the week are planned for customs and such but they work pretty seamlessly into a very fun itinerary. The first stop in Canadian waters is Victoria, on the southern tip of Vancouver Island. Its a beautiful first view of British Columbia and everyone enjoys a bit of High Tea at the Empress Hotel. But then in typical UnCruise fashion we head off into the wilderness. 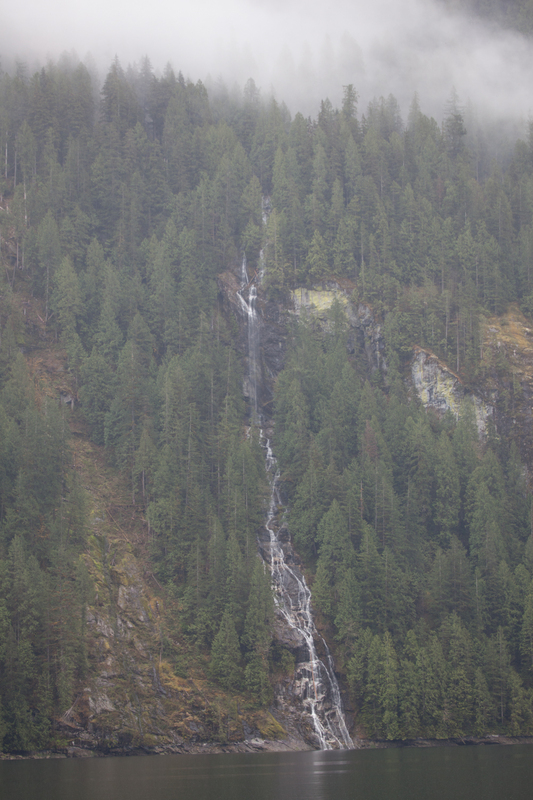 We run the rapids at Skookumchuk and continue on to the crown jewel of the area, Princess Lousia Inlet. 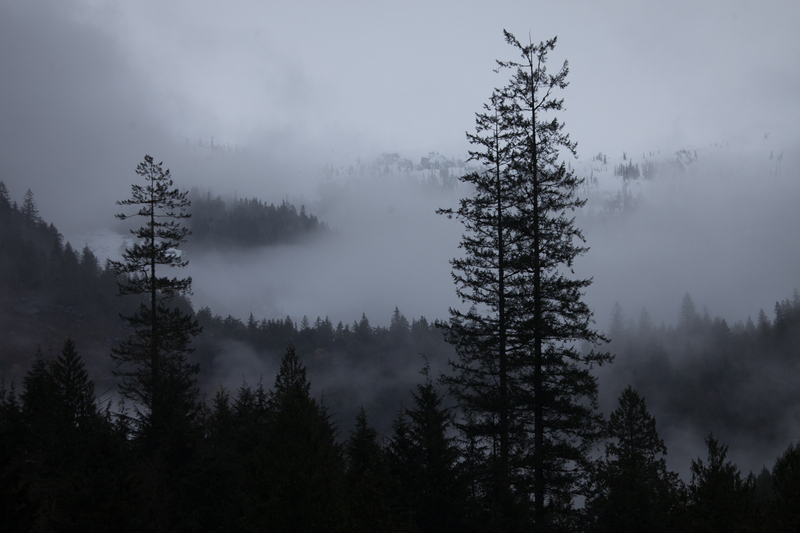 It was here that the mist and fog moved in, which really brought the landscape to life. One moment you could see towering mountain summits, then the next moment they were lost in a sea of white. 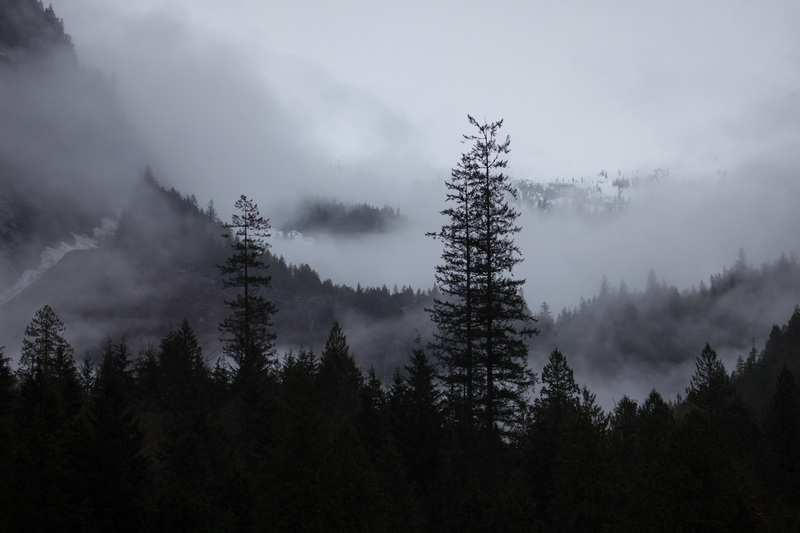 The mist had a way of clinging to the tree covered cliffs as it ran in and out of the trees almost like a river. The calm waters of the fjord cast reflections that tried to trick the eye. 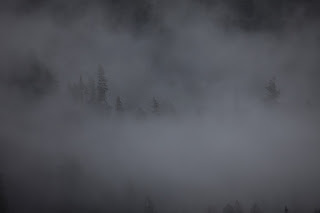 They say that mist can be a landscape photographers delight but you can see here for yourself. I tried to capture some of the mood that the mist brings with it. I do hope for some sunny days in Princess Louisa but I admit, they might not do it as much justice as some good misty fog. So for now I will throw on my rain gear and enjoy the changing landscapes, and guess as to what a sunny day might bring. 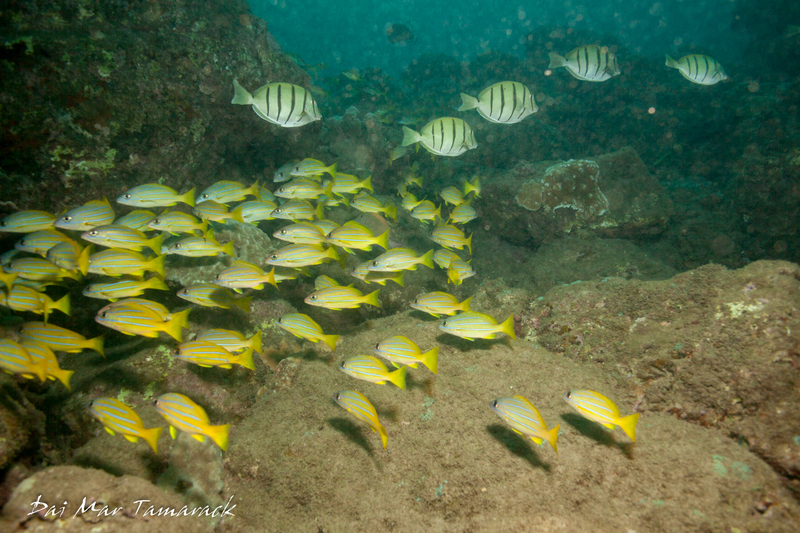 For shore diving the south side of Kauai there is one solid option that will satisfy beginners and experts alike.The name of the place is Koloa Landing. 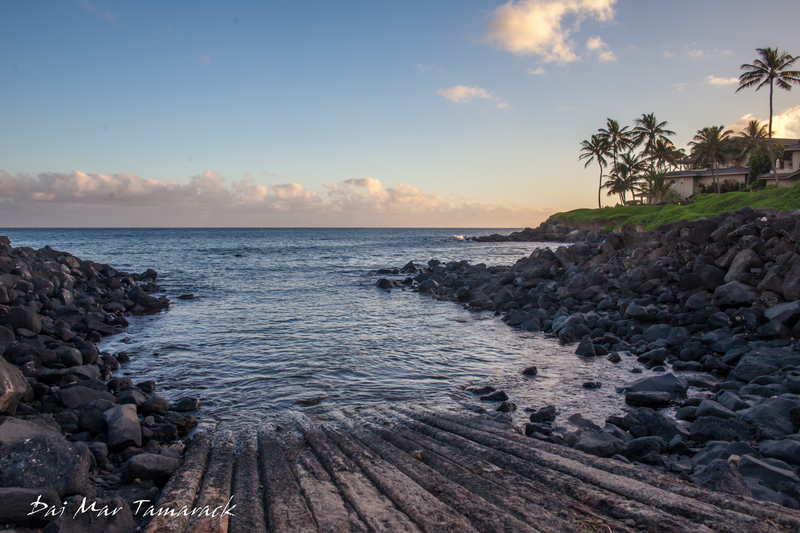 Located in between the resorts of Poipu and the famous blow hole, Koloa Landing provides an easy boat ramp access and gravel parking lot right next to the water. 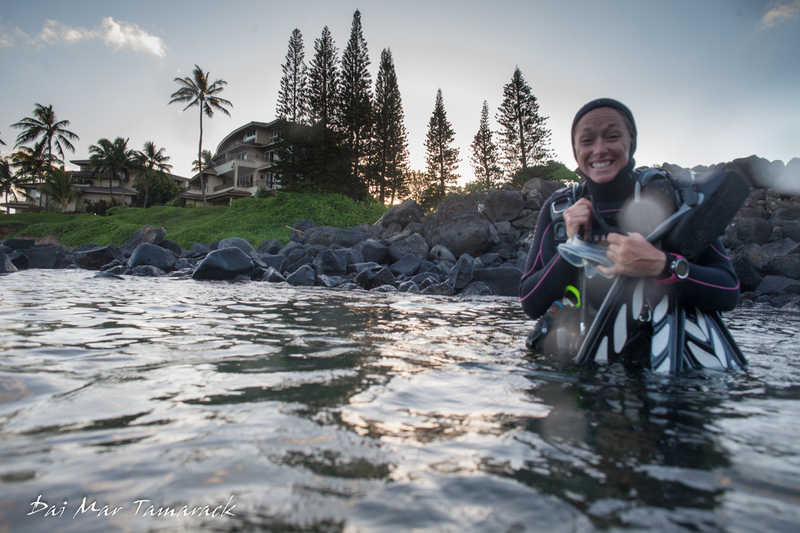 My friend Jess has been working as a dive instructor in Kauai so knows the waters pretty well. She agreed to take me out for a crepuscular/night dive to see what kinds of interesting creatures we could find. After a very easy entry and a short kick out we submerged to a find a large school of blue stripe snapper. Large boulders were strewn about the site with some nice looking coral sporadically among them. 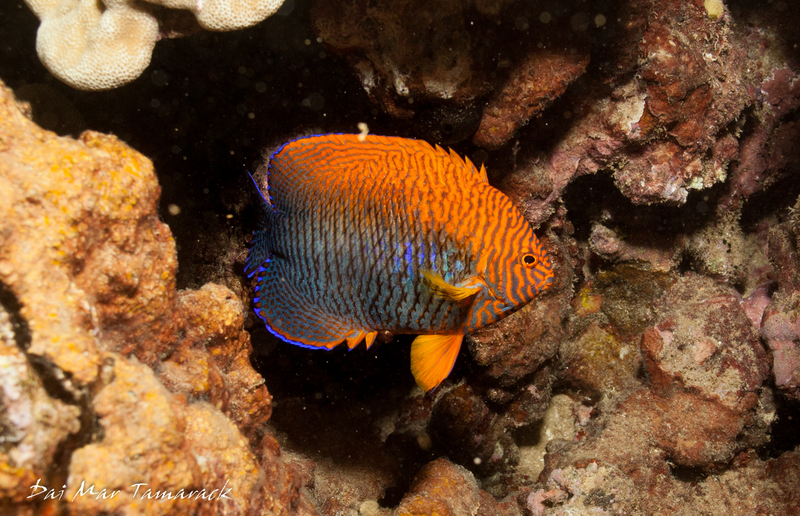 It was in and among the coral and crevices that we wanted to search for the rarer species. And fine them we did. An unusually bold Potters Angelfish stayed put long enough to get a couple of shots, and then a jeweled anemone crab ambled over the top of a rock. It didn't really know which way to go when I put my light on it, which gave me the chance to get a few shots of that as well. 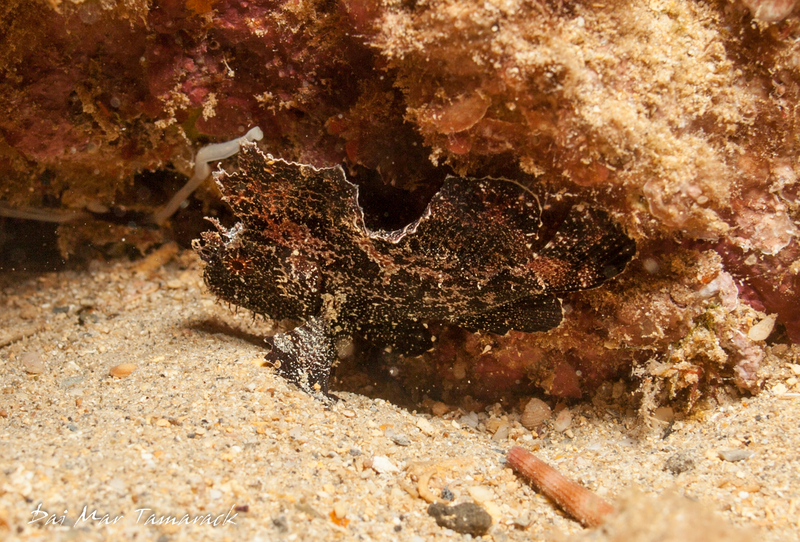 Leaf scorpionfish hid in plain site, while goatfish and parrotfish tried to sleep without being eaten. 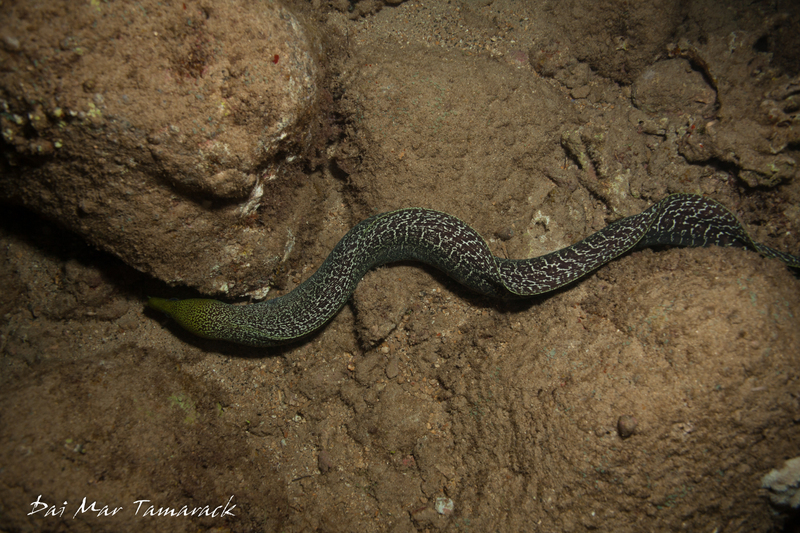 Predatory eels were out and about, possibly on hunt for octopus or sleeping fish. 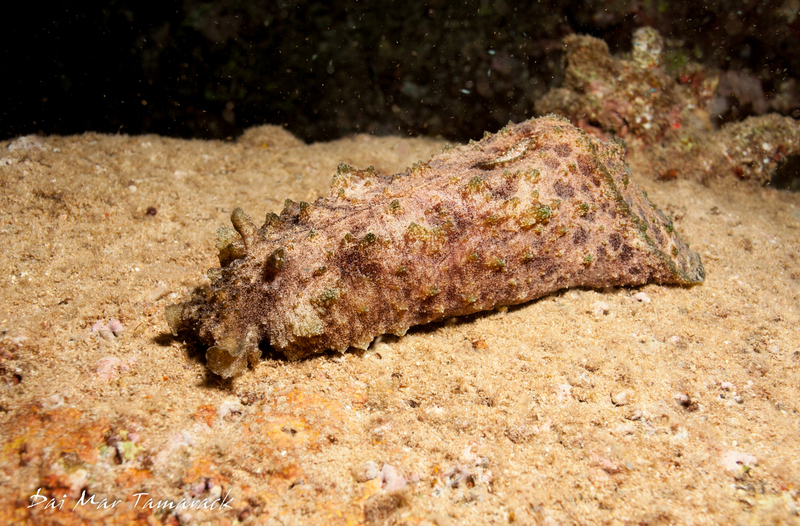 An eared sea hare crawled around near a pin cushion sea star. 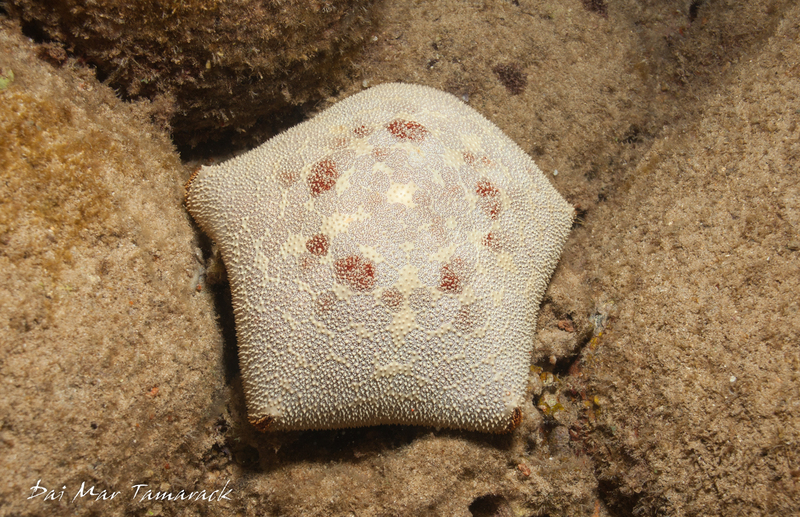 I looked to see if the sea star had any commensal shrimp living on it but I didn't find any. 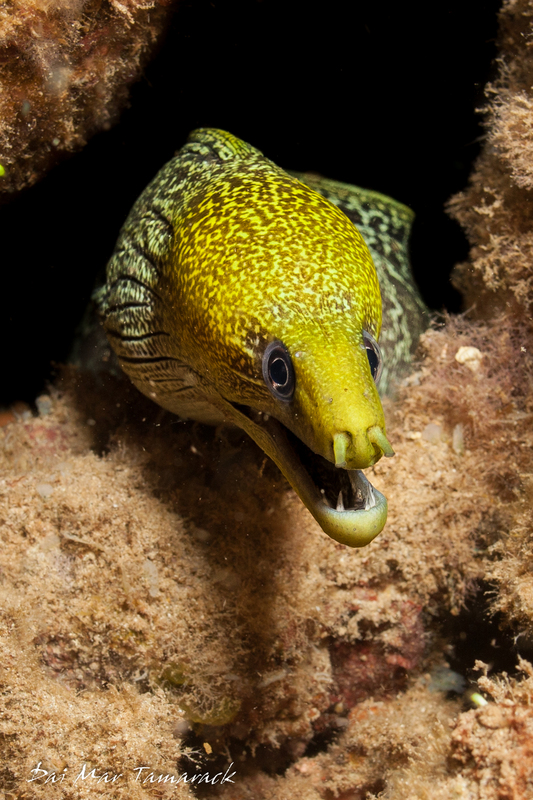 And all this time we spent searching the cracks and crevices were we very aware of the presence of camouflaged scorpion fish and hiding moray eels that could prove a danger for a misplaced hand. 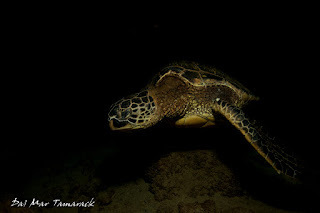 A couple of times throughout the dive we also came across resting sea turtles. It seemed that night time meant sleep for them as well. 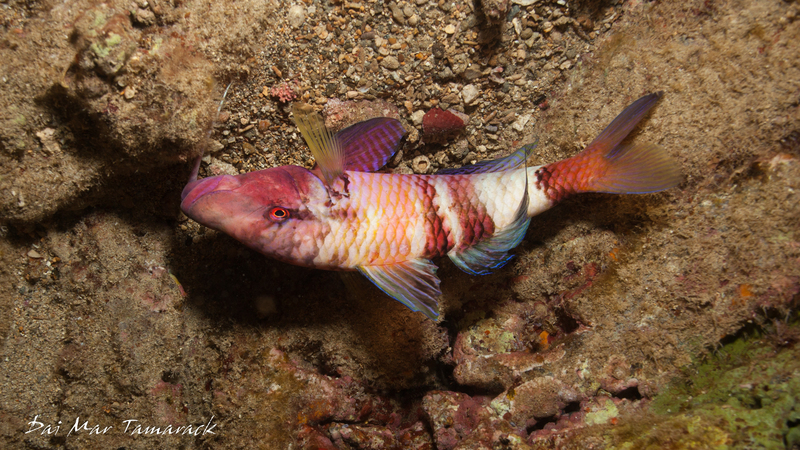 While I don't think the overall diving in Kauai is quite up to that of Maui or the Big Island, there are still some hidden gems to keep the avid diver busy. I feel like many more rare species could be found just at this spot alone. 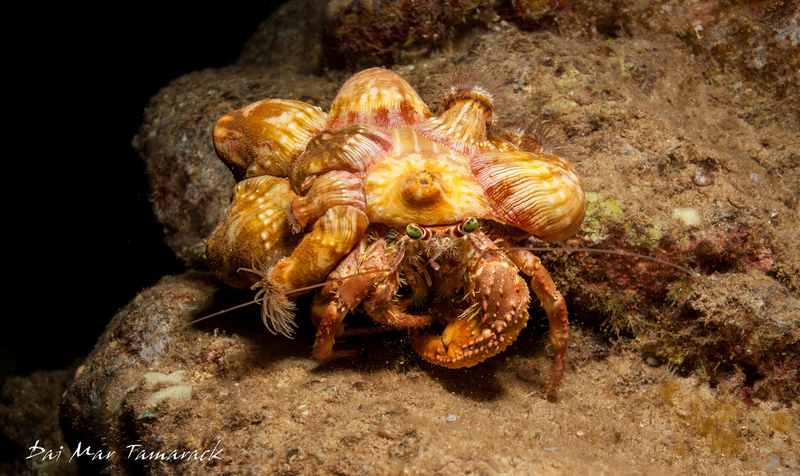 I am looking forward to diving here again, but can't wait to get some nudibranch diving in back in Maui in a few weeks!